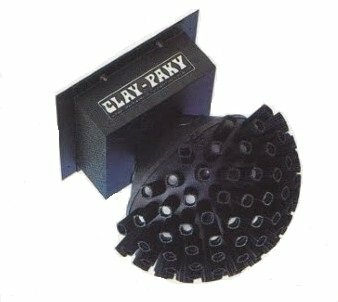 Classic unit from Clay Paky. This is the Astroraggi Twin unit. Similar to the other astroraggi units with lenses but this one does not have the long extruded tubes but much shorter tubes to hold the glass lenses. The other astroraggi units have a spinning half circle with holes in it for random shooting beams of light. The Astroraggi Twin is slightly different. This unit spins the bulbs inside a round platter. 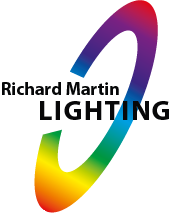 The produced effect is 1 or 2 thin beams of light shooting from each lens and rotating. 1 or 2 beams can be created by turning on 1 or 2 of the lamps in the unit. Lamps are the standard 24 volt, 150 watt FCS that is found in all the Astrodisco units. They are wired on different circuits so you can turn each one on individually or both at the same time. The fixture has a total of 4 circuits for operation. 1 for each bulb, 1 for the rotation motor and 1 for the cooling fan. The unit had an option for a color wheel that could be purchased separately. It would sit above the lamps and snaps in 4 designated holes 90 degrees from each other.